If you haven’t heard, Chicago is currently surviving another polar vortex. Temperatures dropped to a record-breaking number yesterday causing businesses to shut down and people to embrace the art of hibernation. Those of us who have the ability to hole up in our homes all day without having to leave for even a second don’t mind this one bit. However, anyone who has to brave the cold probably wishes they relocated anywhere else at this point. Regardless, if there’s one thing Chicago knows how to do, it’s survive winter. So whether you love it, hate it, or care less either way, the city has your back. One of the ways we survive the cold temps in Chicago is through fire...literally. Many restaurants, bars, and hotels have fireplaces to cozy up the environment and add an extra layer of warmth for a true wintry experience. When you’re feeling brave enough to venture out the door again, head to one of these spots around the city. Grab a drink, order something with a million calories and relax with friends. Arguably one of the best rooftop bars in Chicago, drumBAR is a speakeasy-style bar on top of the Raffaello Hotel in the Gold Coast. drumBAR serves craft cocktails alongside an impressive menu featuring expertly curated whiskeys, scotches, bourbons, and cognacs. Seating is cozy without even needing a fireplace thanks to the plush leather furniture throughout the space. 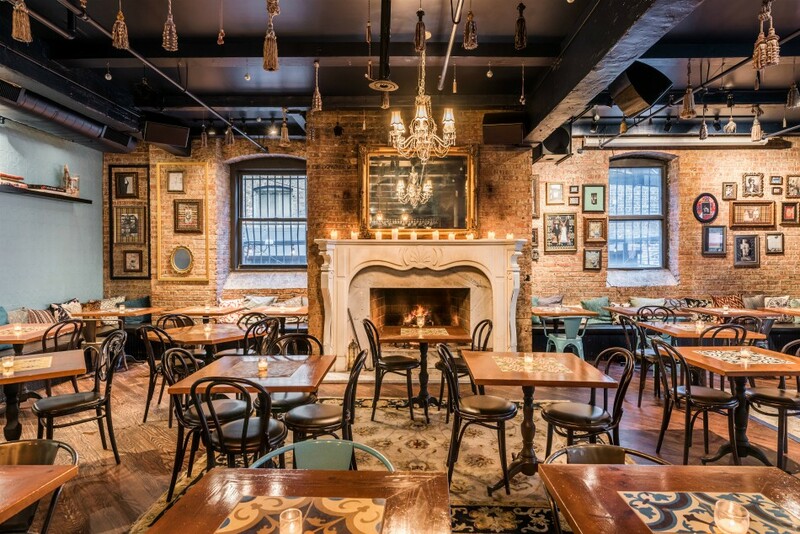 The real showstopper is the large hearth in the center of one of drumBAR’s interior spaces off the main entrance. Grabbing one of the tables near the fire might be one of the hardest things you do all week but it’ll be well worth it. drumBAR has a masculine feel to the space, almost a Mad Men type of vibe. It’s a cocktail/drink-only bar so if you’re a lightweight make sure to stop somewhere for a bite to eat first. My suggestions? Head there for happy hour to warm up before dinner at a nearby restaurant or stop by for a nitecap before heading home for the night. The West Loop is arguably one of my favorite neighborhoods to explore in Chicago. There are so many mind blowing restaurants to discover including this particular gem, RM Champagne Salon. Anyone who knows me knows that bubbly, specifically Champagne, is my number one favorite drink with the exception of a really great glass of Sancerre (which seems to be liquid gold if you find it in the states). RM Champagne Salon is a delightful French bistro come to life right off of the famous Randolph Street with an almost rustic decor. The decor is hard to explain which gives you all the more reason to discover it for yourself. We’re here to talk about the fireplace though. Tucked against a brick wall towards the center of the room is this ornate hearth. What’s better than sipping a glass of bubbly while feeling the warmth of a fire in this gorgeous space? RM Champagne Salon is one of those places to take people from out of town if you want to impress them. Their menu is refined but approachable and not terribly priced by any means, especially for the West Loop. Anytime I have family or friends in from out of town, I always make sure to take them to the Chicago Athletic Association Hotel. Between the jaw dropping views at Cindy’s and the cozy, casual atmosphere of the Drawing Room, the CAA has it all. 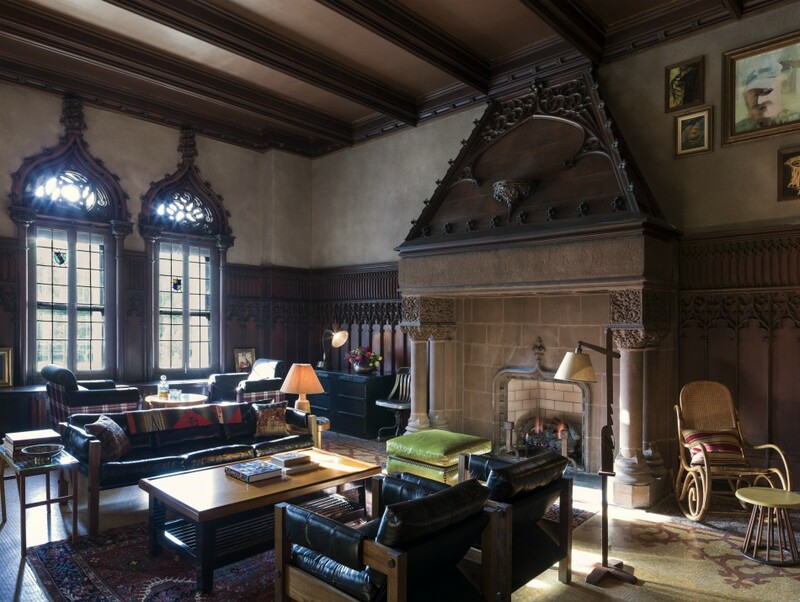 The Drawing Room has not one but three fireplaces throughout the space. You’ll find a variety of comfy chairs and sofas as well as long tables for co-working, pool and other game tables, plus more. It’s really an all-purpose type of space for everyone to enjoy whether you’re a local looking to relax or a hotel guest passing time. The Drawing Room has an all-day menu of food and drinks plus fantastic coffee. Everything is refined but in a really casual way which is one of the things that sets the Drawing Room apart from other establishments. This space is meant to provide comfort and a casual environment yet everything is still on another level of quality and sophistication. This is also one of the best places to get unbeatable views over Michigan Avenue without completely freezing. I discovered the Broken Shaker while working on my Chicago Coffee Shop Series. It’s in the same space as Cafe Integral in the Freehand with an almost bohemian vibe. Stay with me because I really love this space. Where Cafe Integral ends, the Broken Shaker begins. The two overlap for a few hours in the late afternoon when you can get a handcrafted cappuccino and cocktail at the same time but they operate separately. Broken Shaker has a menu of internationally-inspired bar food and small bites as well as cocktails. It’s a fun, cozy space to enjoy time with friends. Farther into the space, you reach a fireplace that’s tucked into a corner. Because it feels more intimate being elevated from the main space, it’s extra cozy. It doesn’t hurt that it’s pretty far from the door either! Located in East Lakeview just south of Belmont on Broadway, Wilde Bar & Restaurant was one of my favorite places to frequent while living nearby. The Irish Bar & Restaurant knows how to serve up comfort food in a cozy setting. There are little inspirations throughout the entire space from Oscar Wilde himself including portraits, books, and more. 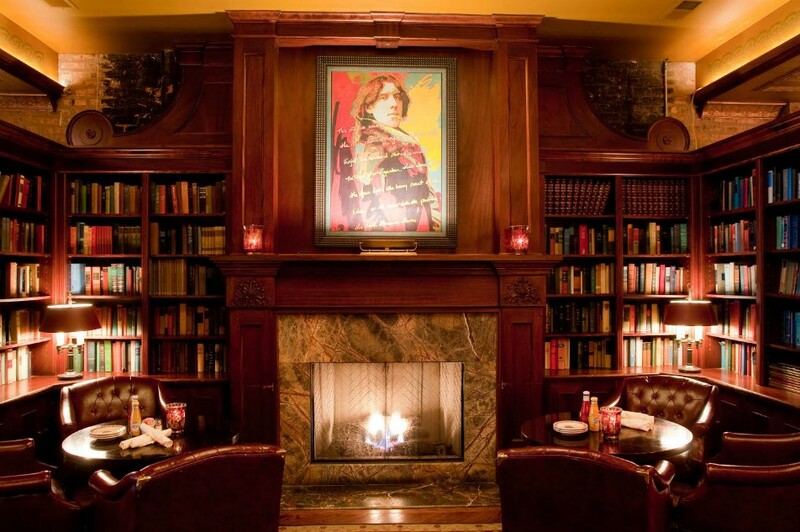 The fireplace at Wilde’s just so happens to be located in a little library nook that makes me melt thinking about it. A sure way to a girl’s heart is lots of books, food and a warm fire...or is that just me? For anyone who thinks you can’t go gluten-free at an Irish Bar & Restaurant, think again because Wilde’s actually has a fairly extensive menu. It’s rare that I find a restaurant to accommodate all the picky eaters in my family and Wilde’s is one of those places. That in itself should say quite a bit. So tell me….are you braving Chiberia this week or staying in? What are some of your favorite places to warm up in Chicago? Shout out in the comments below.